turn and empathic Neptune. These forces don’t often get along with each other so well. This is an excellent time to deepen spiritual practice that is in alignment with pragmatic reality. Oh where did I put my body? It wouldn’t surprise me if this question comes up in the next few days, if it hasn’t already. The elemental energy is shifting. The fact that the current lunar cycle* began in an earth sign is perhaps all but a dim memory since the only planet left in earth right now is Pluto on the edge of our solar system. Pluto’s been in an earth sign since 2008, so that can’t be too big a deal, right? Yes, Pluto is always a big deal, astrologically that is, but this planet alone can’t make up for the fact that there are no other planets in earth right now. That matters. I invite you to travel to the far past of three weeks ago when the New Moon in Taurus kicked off. Four planets (I’m calling the Moon and Sun planets here) were in Taurus at that time and Venus had just completed her transit through Taurus. Embodied Earth influenced our hopes, dreams, and intentions for this lunar cycle. Earth was the teacher and the initiator. Depending on your own relationship to this element, you may have relished or struggled with this chance to let Taurean values be the guiding force. Whatever it was like for you, we may truly miss the slower pace, the sense-based wisdom, and the grounded determination that Taurus invited into our bodies. As Air and Water become the driving forces for the next few weeks, we get a primer on the differences between reality-based Earth and these more fluid elements (Water and Air). In the procession of the year, each sign provides contrast to the one before and a foundation for the next. During the time of the Taurus lunar cycle, we planted a cord in the earth that can be used to return us to what we have learned and accomplished. This cord is an anchor to a better relationship to resources, a better knowledge of our values, and a better way to discern when enough is enough. This anchor will help us as we move forward. Evaluating this cycle, noting the benefits, and surrendering the forms are all in preparation for a new lunar cycle in Gemini that begins on June 8. Sunday, June 2. Be active today, and if possible do something completely new. The Aries Moon makes favorable contacts with Mars helping us to move through stress or conflict stirred up by the Moon also contacting the Uranus/Pluto square. If you are willing to let go of expectations for perfection or a particular outcome, you can make a breakthrough in something that has been bothering you for a while. Begin honing your emotional IQ as Venus enters Cancer, joining Mercury already in this sign of watery instinct. Because the Moon is waning, tune in to what your emotions tell you about letting go. Monday, June 3. Water is the theme today, and for the next two months, really. Water signs are known for having greater ability to understand and express emotion. How do you define emotion? Consider this definition: “Joseph LeDoux, a neuroscientist at New York University’s Center for Neural Science, describes emotion in terms of “survival circuits” that exist in all living things. An organism, as simple as an amoeba or as complex as a person, reacts to an environmental stimulus in a way that makes it more likely to survive and reproduce. The stimulus flip switches on survival circuits which prompt behaviors that enhance survival. Neurons firing in a particular pattern might trigger the brain to order the release of adrenaline, which makes the heart beat faster, priming an animal to fight or flee from danger. That physical state, LeDoux says, is an emotion.” [http://nautil.us/issue/1/what-makes-you-so-special/artificial-emotions] A Grand Water Trine involving Mercury in Cancer, Saturn in Scorpio, and Neptune in Pisces has all of us diving into the realm of emotion. Whether we think of our feelings as “survival circuits” or not, honor the wisdom of feeling and flow. Moon enters Taurus 10:53 am. June 4—Balsamic Moon: Surrendering. The Moon returns to Taurus. 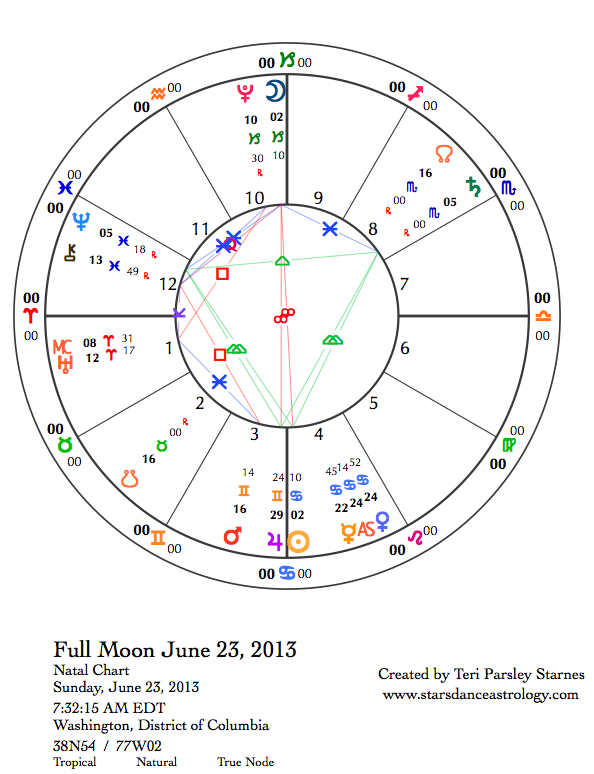 Notice the difference between the last two days of a firey Aries Moon and the next three days of a Taurus moon. Part of the process of surrendering the experiences of a lunar cycle is to honor what it has meant. We get to keep these lessons as we acknowledge that this season is now passing. The Moon forms a Kite aspect configuration to the planets in the Grand Water Trine, still active from yesterday. This means, the Moon is opposite one planet in the grand trine (Saturn) and is in an encouraging sextile aspect to the other planets. (These are Venus, Mercury and Neptune.) The opposition to Saturn is a spine showing that the greatest support comes from holding intention and doing the work we need to do. What a great day to make use of Earth to form a container holding Water. What does this metaphor look like to you? I imagine a cup that holds my heart, keeping it safe, centered, and open to giving and receiving. Develop your own metaphors today. These images hold power. Wednesday, June 5. A one-and-a-half-day void-of-course (VOC) period begins today at 8:25 am. 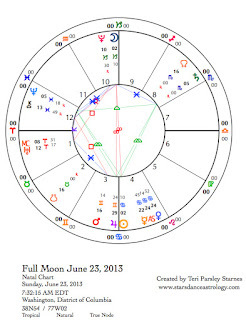 The last aspect the Moon makes while in Taurus is a harmonious trine to Pluto. Then we get to hang out without any major transits at all until the Moon enters Gemini at 10:32 pm on June 6. This is a longer than usual VOC period and seems apt for doing the releasing work of this Taurus lunar cycle. Usually when the Moon is VOC, we either don’t feel like beginning new things, or if we do, we don’t have the energy we need to follow through. How does this feel to you? If you are stressing about getting things done, remember the anchoring cord to all the gifts from Taurus. You are enough and the timing is just right. Thursday, June 6. Everything I said yesterday still applies. However, you may be itching to move out of stagnation even more today. The Gemini Moon is calling, and really becomes active tomorrow. Patience and a willingness to let go will serve to help you embrace the inrush of Air that is coming. Friday, June 7. Even though the New Moon in Gemini technically begins tomorrow morning, it feels like it begins today. The stage is being set for our coming intentions for the next lunar cycle. Neptune, a key part of the Grand Water Trine of this week is especially powerful today because it is stationing retrograde. The next lunar cycle is colored with oceanic feelings, a desire to expand beyond all boundaries, and a tendency to lose ourselves in the process. Being lost is not the problem; that is part of any transformative journey. Giving up on our journeys, by numbing our feelings through any kind of addictive behavior is the Neptune problem. Mars and the Moon in Gemini form a square to Neptune, challenging us to not give in to impatience or having to understand the process in a logical, rational way. It is time to trust intuition, even when it is terrifying. There is a lot of encouragement this lunar cycle to develop deeper, authentic connection with others. It is all about choosing to let ourselves be vulnerable even when everything inside us screams, “Protect!” There is a middle ground. We can honor the urge to build safe containers for our feelings and also leave just enough opening so that we connect with others. Connection/communion is a huge theme for this Gemini Moon cycle. The planets are also making lots of connections with each other. Mercury opposes Pluto—perhaps the first act of vulnerability will be to share your truth with someone else, even if it feels scary. However, remember our truth belongs to us alone and we can’t expect anyone else to embrace it. Mars quincunx Saturn provokes the paradox between mind and heart. We must avoid disassociating from strong emotion while at the same time use our minds as tools to bring understanding to what we feel. With communication being another huge theme this lunar cycle, the struggles we have to communicate clearly today show us where we need to grow. 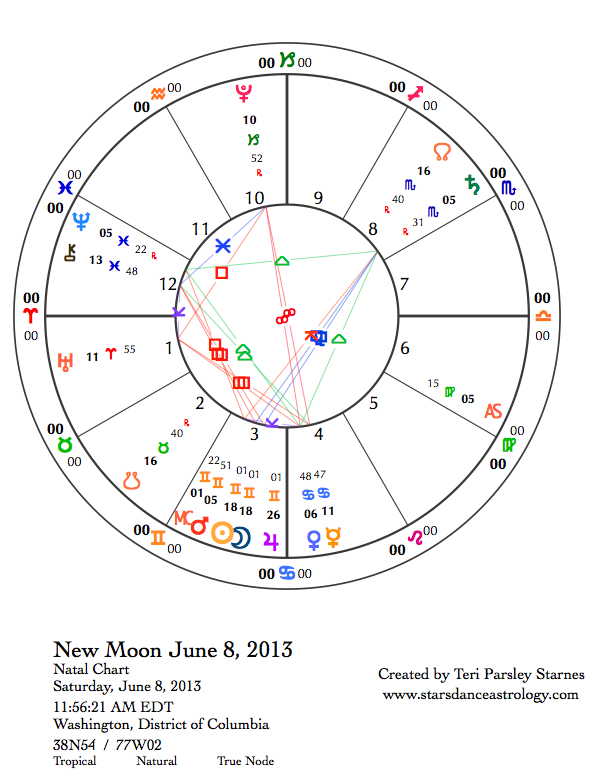 June 8—New Moon: Dreaming. In the season of Taurus, the earth awakes with incredible fertility. Flowers are the promise that this fertility will give us fruit and seed in the coming months. To make sure this happens, we need pollinators. Flowers are calling out to these pollinators as seductively as anything in nature can, to come and spread their goodness. These pollinators busily visit flower after flower so the fruit can come. Before setting your New Moon intention, notice the pollinators around you—the bees, small insects, all the busy ones who ceaselessly buzz around blossoms. They teach us about the potential inherent in this cycle. We learn a lot about the motivations and gifts of Gemini from them. 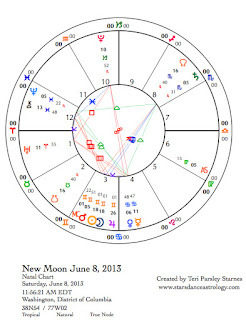 All the transits from yesterday hold true for the New Moon chart. Mercury and Venus in Cancer are forming a t-square aspect pattern with the Uranus/Pluto square—a tense and triggering energy, especially in relationships. However, Mercury and Venus also are completing the harmonious flow of the Grand Water Trine. This sets up an interesting dynamic of complex responses: busily pollinating and connecting, flowing into deep feelings, and/or being triggered to make transformative change happen. This complexity seems appropriate to Gemini, which loves to adapt to ever-changing patterns of influence. How adaptable are you? We are invited to become pollinators in our worlds. Imagine the delight! I'd take no money, I'd give my time.